Walter Potter started to experiment with taxidermy in 1854 (at the age of 19). 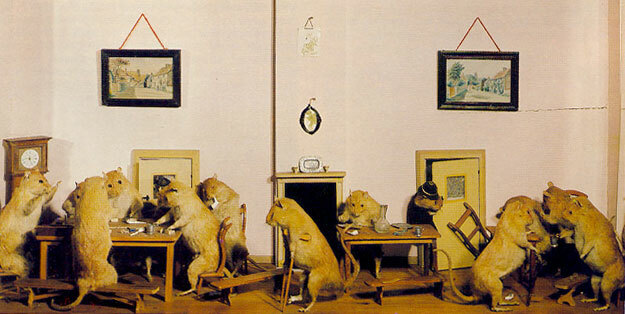 Although his profession was traditional taxidermy, he is famous for his anthropomorphic dioramas. These were displayed in his family’s pub, The White Lion. Features 48 rabbits performing multiple tasks from math to sewing. 18 European Red Squirrels in a gentlemen’s club. Companion to The Upper Ten. Made up of 15 Brown Rats in a much more rambunctious setting than the squirrels. Potter’s only display with clothed animals. After the Victorian Era, however, interest in taxidermy wavered. Unfortunately, in 2003 the collection was broken up in an auction. All together, the collection (consisting of 13 pieces) sold for £97,700. It is such a pity that the pieces could not stay together. Although I could never hope to be as eloquent as my splendid counterpart (A), I’m going to try to entertain you with a new outlook on an ancient art. Taxidermy. Now, please be warned: I am no animal activist nor am I some barbaric killing machine. I’m simply trying to bring light on the often overlooked beauty of taxidermy. It is much more than some overstuffed cadaver meant to hang in a pompous gentleman’s smoking lounge. Most of us have seen the traditional deer head mounted on a mahogany base. But that is more of a remedial example of how exquisite taxidermy can be. 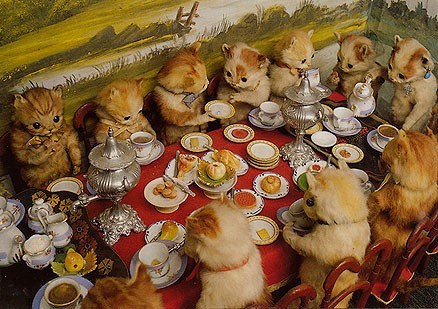 What about kittens having a tea party? Squirrels having a sword fight? Or even a chair made out of sheep. This new (although it is just as old as traditional taxidermy), revived style of taxidermy is called rogue taxidermy and is opening up what was once a stuffy and pretentious collection up to a new generation and market. As defined by Wikipedia (the most trustworthy dictionary haha), rogue taxidermy is “the creation of stuffed animals which do not have real, live counterparts.” I cannot argue this. Never in my life have I met a sword-bearing squirrel ready for a duel. But I can argue the idea that this is not real taxidermy. 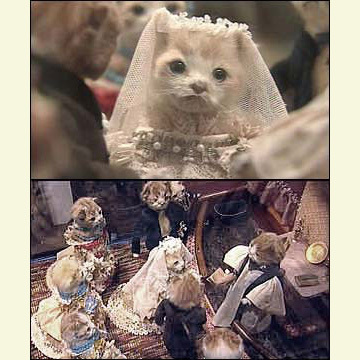 Because many pieces of rogue taxidermy are “hybrids” of unrealistic animals and often used in sideshows and the like, it is often frowned upon. To me, the creative genus needed to even consider such an outrageous concept is worth admiring. These “hybrids” of taxidermy are what taxidermy is truly meant for: a representation of a once living thing in a form that will both outlive its mortal life and also demonstrate what the animal stood for in life. Animals are fun. That is why we adore them. It is as simple as that. The “fun-ness” (for lack of a better word) is why people love rogue taxidermy. It’s not just a trophy of death, but rather a celebration of life. This art is little known (in comparison to many other phenomenons), but with the growing popularity of vintage and antique, I assume that a love for taxidermy will soon catch on.